The Millsaps women’s lacrosse team has faced more than its fair share of adversity since the end of last season, which notably saw the team finish with a winning record in only its their third year of existence. Former head coach Tracy Cepnio left her position to obtain her master’s degree. Replacement Monica Potter emailed the team the day she was supposed to arrive on campus to let them know she wouldn’t be coming. She had accepted the head coaching job at Colorado State-Pueblo. This left the team to run fall practices independently in preparation for their spring season. The Lady Majors are limited in numbers, having the exact amount needed to field a squad. “We can’t stop. We won’t stop. Our team has come so far since the program’s first year. We’ve lost a few players and a coach along the way but this is our time. 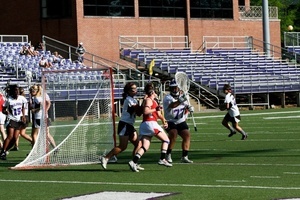 We’re going to build on last season’s success,” sophomore midfielder and attack Katie Iskra says. On Monday the athletic department announced former Major and conference player of the year in volleyball, Kasey Laird, would serve as interim head coach. Laird also currently serves as the assistant coach to the volleyball team. “Discipline and effort will be the two things I expect,” Laird says. “With these two characteristics we have the ability to accomplish great things this year.” Interested athletes are encouraged to come out and try lacrosse in the spring.